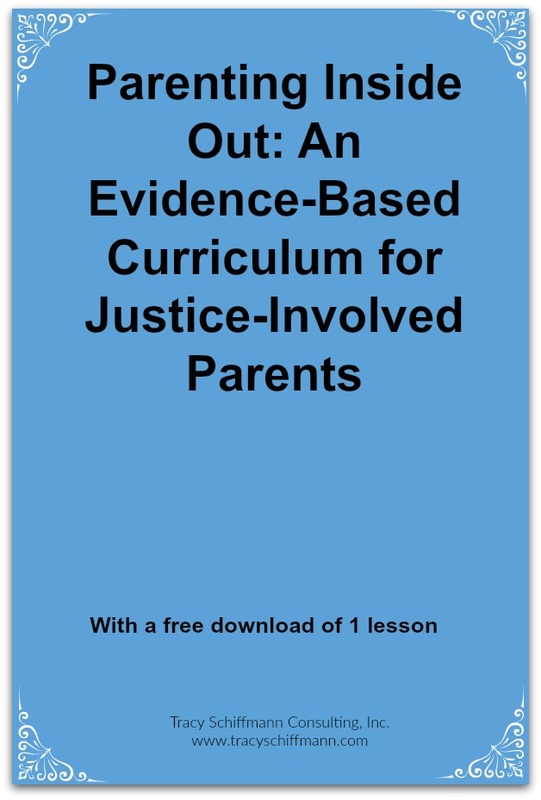 Parenting Inside Out: An Evidence-Based Curriculum for Justice-Involved Parents — Tracy Schiffmann Consulting, Inc.
PIO is an evidence-based parenting program. I have been working with the Parenting Inside Out (PIO) program for more than three years. Copyrighted in 2007, Parenting Inside Out is an evidence-based parenting skills training program developed by the Oregon Social Learning Center (OSLC), the Oregon Department of Corrections and Pathfinders of Oregon. Tracy was the first author of the curriculum, along with several scientists from OSLC. PIO was developed for parents involved in the criminal justice system, including being in prison or jail, on parole or probation. PIO was piloted in the Oregon state prison system and has become one of the most popular programs inmates can take. The community and jail versions of PIO were developed from the prison version to fit the needs of parents parenting in different environments. Skill building is at the core of PIO. PIO is different from most of the parenting programs in the market in that it emphasizes skill building, rather than acquiring information for information’s sake. First of all, PIO instructors are called “coaches” not “teachers,” emphasizing that their role is to help parents build skills and develop their ability to problem solve. PIO is learner-centered, not instructor directed, and coaches weave together lessons and class activities with what is going on in parent’s lives – are they having trouble communicating with their child or the child’s caregiver, is a child acting out, is a particular discipline strategy appropriate for the child’s age and stage of development? Parents are responsible for their own learning and work together to help one another solve problems and develop new skills. PIO is outcomes-based so parents demonstrate their learning through role-play and practice with their children if they have custody, or during phone calls and visits if their children don’t live with them. They report back to the class how an interaction went and seek input from the coach and their classmates as they evaluate what worked and what didn’t. To simulate having 24/7 responsibility for a child, incarcerated parents adopt a bear. They have to ensure that the bear is adequately cared for, including finding child care for the hours they work. If a corrections officer finds an unattended bear, it is taken into protective custody. The entire PIO class helps the parent look at what happened and develop strategies to care for the bear before it is returned to the parent’s custody. PIO underwent a randomized controlled trial. Oregon Social Learning Center received a $2.1 million grant from the National Institute of Mental Health to study the impact of PIO. The results of the study demonstrated that PIO has a significant positive impact on a range of factors from recidivism to parent/child relationships and use of specific parenting skills. The study results will be published early in 2012, and have led to PIO being designated an evidence-based program. PIO is sold nationally and internationally. In 2008, the Children’s Justice Alliance began marketing PIO to departments of corrections and nonprofit community social service agencies across the country. PIO is now in use in California, Kansas, Pennsylvania, Michigan, Washington, Iowa, Rhode Island and Australia. After a worldwide search for a parenting program for its state-of-the-art Marngoneet Correctional Centre, the Australian Department of Justice chose PIO. The Australian program graduated its first group of Dads in October. We are thrilled that PIO continues to gain momentum and acceptance in programs across the county and now around the world. Read more posts about the PIO curriculum. Download a sample PIO lesson and course topics. Click on the following links to download the course topics for the version of the curriculum that best meets your needs. Click the link for a PIO lesson sample. Get in touch with Mindy to purchase PIO. If you are interested in bringing the community, jail or prison PIO program to your community contact Mindy. Mindy Clark is a communications and marketing professional with more than 30 years’ experience working with domestic and international corporations, government agencies and not-for-profit organizations to develop and implement outreach, marketing, business and development strategies.